Persistence Market Research tables an exhaustive study of the global kidney dialysis equipment market in a new publication titled ‘Kidney Dialysis Equipment Market: Global Industry Analysis and Forecast, 2016-2024.’ The report frames a bird’s eye view of the Global Kidney Dialysis Equipment Market and also explains the regional market psyche and talks about the all the major segments of the Global Kidney Dialysis Equipment Market. After scrutinizing the market the report divulges some key information about the major shareholders functioning in the market. In this eight-year assessment the report predicts some crucial financial and demographical changes that are likely to impact the market in the coming decade. A dedicated team of analysts did an in-depth study of the market and identified the drivers that are expected to set the course of the market in the forthcoming years. The report describes elaborately the effect of these drivers on the present and future fabric of the Global Kidney Dialysis Equipment Market. They also collated some trends that will help investors understand the core behavior of the market. The report also highlights the restraints that might drag down the organic expansion of the Global Kidney Dialysis Equipment Market. The report on the Global Kidney Dialysis Equipment Market begins with the market overview and then talks about the segmentation of the Global Kidney Dialysis Equipment Market. The report provides a 360 degree view of all the regional markets and projects their revenue and value share and also puts forth the compound annual growth rate of the specific regional market. The research team has delved deep to create an extensive canvas of the regional markets spread across the globe. The report vividly compares all the segments and projects the best performing segment that will topple others. The insight also elaborates on several reasons that are expected to back the growth of a particular segment. The last segment of the report is set aside for the prime contenders of the Global Kidney Dialysis Equipment Market. The report scrutinizes the market performance of some of the key players. The report lists all the companies contributing to the development of the Global Kidney Dialysis Equipment Market. The report reveals the future market strategies of these companies and also tables news about some key acquisitions and mergers and analyzes their future course of action in the Global Kidney Dialysis Equipment Market. This section provides a dashboard view of the competitive landscape of the Global Kidney Dialysis Equipment Market. An in-depth secondary research fished out some crucial information on the overall market size, top market players and also revealed names of the top products and industry associations. The Persistence Market Research analyst team spoke to several industry insiders to understand the climate of the market. The data collected through exhaustive research was further validated through the triangulation method. In this report on the Global Kidney Dialysis Equipment Market, we have encapsulated the key metrics that accurately describe the Global Kidney Dialysis Equipment Market and used this data to compare market performance across the various segments and regions. We understand that the nature of the global economy is very volatile and hence besides estimating the CAGR for the Global Kidney Dialysis Equipment Market, we have also analyzed the Global Kidney Dialysis Equipment Market on the basis of growth parameters such as Year-on-Year (Y-o-Y) growth to understand market predictability and to identify the right opportunities likely to emerge in the Global Kidney Dialysis Equipment Market. Further, we have studied the different market segments by conducting a Basis Point Share (BPS) analysis to understand the relative contribution of individual segments to overall market growth and hence identify the many key trends governing the Global Kidney Dialysis Equipment Market. Another notable feature of our report is an analysis of the revenue forecast of the Global Kidney Dialysis Equipment Market in terms of absolute dollar opportunity, critical in assessing the level of opportunity that market providers can look to achieve and also to identify potential resources in the Global Kidney Dialysis Equipment Market. Our report on the Global Kidney Dialysis Equipment Market provides a market outlook for the period 2016 – 2024. The annual change in inflation rate has not been considered while doing the research. All values for 2016 have been registered to provide a transparent view of the market. The global kidney dialysis equipment market is primarily dominated by two important players Fresenius Medical Care AG & Co. KGaA and Baxter Incorporated who collectively hold a significant market share of more than 60%. The Germany-based Fresenius Medical Care AG & Co. KGaA (Fresenius SE & Co. KGaA) has a robust presence in the various markets spread across the North America region. All the major companies present in the global kidney dialysis equipment market are eager to stay afloat in the highly competitive North America market by rapidly expanding and trying to venture into new zones with new product categories; however, leading market players are also tweaking their strategies to venture into new territories spread across another growing regional market – the Asia Pacific. The North America region will hold more than 25% of the revenue share of the global kidney dialysis market till the end of 2016 but the market will lose its sheen by the end of 2024 because of emerging competition from the other corners of the globe. The improved healthcare economy in the APAC region will create a better ambience of growth for the global kidney dialysis equipment market. The APAC region is expected to witness a CAGR of 9.9% by the end of the assessment period. The global kidney dialysis market of the APAC region will pocket a little over 30% of the total market share in 2016 and it will likely cross 35% by the end of 2024. By the end of 2024, the North America kidney dialysis equipment market is likely to create a revenue bank of more than US$ 5700 Mn, witnessing a CAGR of 3.9% by the end of the foreseen period. 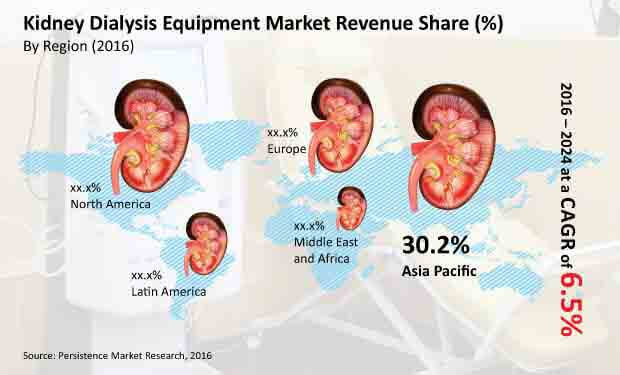 New channels of funding in the healthcare domain, better healthcare infrastructure, soaring number of dialysis patients and adoption of advanced technologies in the dialysis equipment domain are factors expected to help the North America regional market stay in competition with the fast rising APAC kidney dialysis equipment market. The APAC kidney dialysis equipment market is expected to showcase a staggering growth throughout the forecast period. Domestic manufacturers of kidney dialysis equipment in APAC are giving strong competition to their global peers by producing cost-effective products that are high in demand in the local and global markets. NIPRO Medical Corporation, another leading company operating in the global kidney dialysis equipment market is planning to strengthen its sales network in developing regions such as Africa and India. By gauging the growth potential of the APAC region most of the key players in this segment are planning to penetrate deep into this virgin territory and are trying to clench the maximum share of the market. In the North America region, the US and Canada are expected to rule the roost with their outstanding performance during the period of forecast. The US kidney dialysis equipment market is predicted to witness steady growth because of the massive adoption of new technologies in the kidney dialysis division. Manufacturers are also queuing up specialized hemodialysis as well as peritoneal dialysis machines with different interventions, which will also impact the end-user experience. The boom in public healthcare expenditure in Canada is expected to open a new path of development for the Canada kidney dialysis equipment market. Japan, Australia, New Zealand, India and China will spearhead market growth in the APAC region. These countries will register promising CAGRs within the period of assessment. The spiking economy of these countries is expected to attribute to the revenue growth of the global kidney dialysis equipment market.